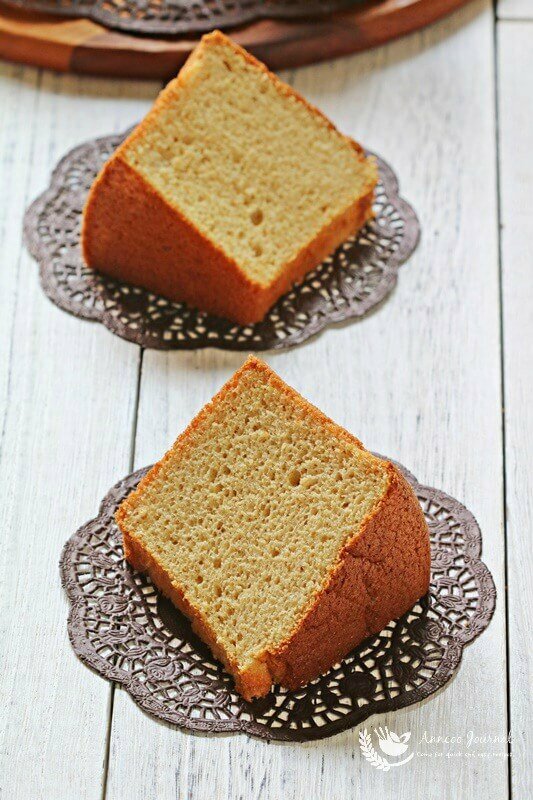 I have always wanted to bake a Gula Melaka chiffon cake for a long time but have been been procrastinating. 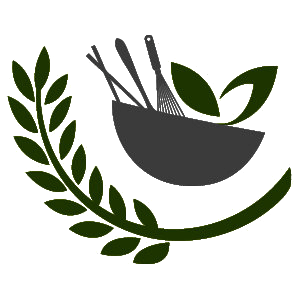 Many great bakers had shared their recipes in different versions. Just recently, my good friend, Eileen shared her pretty gula melaka chiffon cake on her blog and that spurred me on to bake one too. I’ve no regrets baking this cake as it was tasty, soft and tender and I like the aroma of the gula melaka syrup which made the cake so fragrant. Thank you Eileen for sharing this recipe. This cake is tasty, soft and tender and the aroma of the gula melaka syrup made the cake so fragrant. Place gula melaka, coconut cream and pandan leaves into a small pot. Boil at low heat and till gula melaka dissolves. Pass syrup through a sieve and set aside to cool. Egg yolk mixture -In a large bowl, stir well egg yolks, and coconut oil with a hand whisk, followed by the gula melaka syrup. Pour in the cake flour and stir well till combined. Meringue - Whisk egg whites and salt till frothy with an electric mixer at low speed, gradually add in the sugar in batches. Continue beating egg whites at medium speed till stiff peaks form. Pour batter into a 8 inch chiffon tube pan. Bake in the preheated oven at 170 deg for about 45 minutes. Yummy, nice flavour and aroma! Hi Ann, I would like to try but my family cannot take sweet. Which can I reduce gula melaka or castor sugar ? Hi Joanne, The cake is actually not very sweet if you increase the salt to 1 teaspoon. 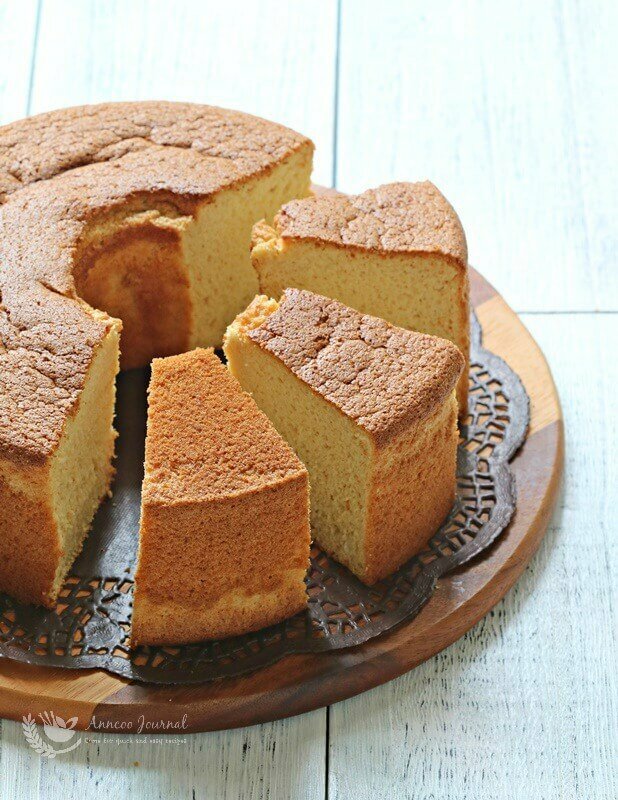 It is better not to reduce the gula melaka syrup if you want to achieve a nice chiffon cake. Hi Ann, this looks delicious! Can you pls advice should I bake at 170 degrees with fan mode or without fan mode? Thanks! 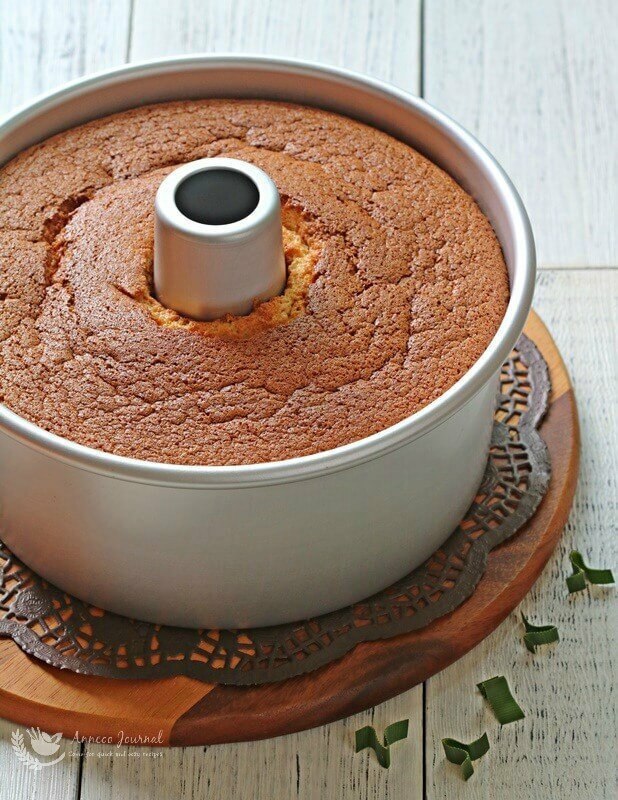 Hi Yirong, I’ve never used the fan mode to bake chiffon cakes. Thanks Ann for this recipe. I will definitely try baking it. Can u tell me what is wrong whenever I invert cake immediately when it comes out of the oven, my chiffon cake will always partially slip out of the & eventually spoils the look of the cake. Pls advise. Thanks! Hi Gina, Your cake was probably under baked and definitely need to bake another 5 to 10 minutes longer. Under-beating egg whites will also cause the cake collapsed. Must be full of aroma with coconut milk and sugar! Gorgeous texture too, Ann.